Researchers from the Wistar Institute report that a gene that was once thought to be found only in the brain is also expressed in breast cancer, and that it helps promote the growth and spread of the disease. Additionally, they showed how a version of the gene with edited RNA prevents metastasis. Their study (“The mRNA Edited Form of GABRA3 Suppresses GABRA3 Mediated Akt Activation and Breast Cancer Metastasis”) was published online in Nature Communications. The causes of metastasis in breast cancer at a molecular level are not very well understood, so identifying regulatory genes that prompt this behavior could have a tremendous effect on survival, from early detection to the design of better treatment strategies. The researchers analized The Cancer Genome Atlas (TCGA) and identified 41 genes inversely correlated with survival in breast cancer. Dr. Huang and colleagues focused on one gene in particular: GABAA receptor alpha3 (Gabra3). The gene was particularly intriguing, as prior to this study, researchers believed that Gabra3 was expressed only in brain tissue. There were three main reasons the researchers determined it was worth studying. First, it is highly expressed in cancer tissues, but not in healthy breast tissues. Second, it’s a gene for a cell surface molecule, something that is potentially targeted by a drug. Finally, drugs that target Gabra3 are already available for treating other diseases such as insomnia. The researchers showed that cells expressing Gabra3 were better at migrating and invading than their control counterparts, and Gabra3 showed metastasis-promoting activity in vivo. Animal models injected with the activated gene all developed metastatic lesions in their lungs. 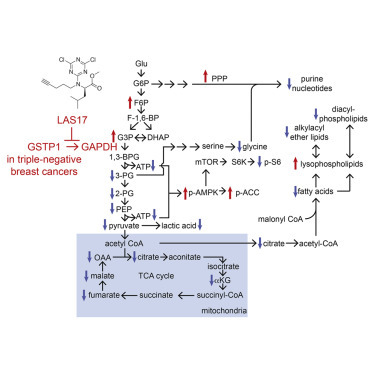 The gene functions by activating the AKT pathway, a cellular pathway essential to cell growth and survival in many types of cancer, including breast cancer. In some instances, though, certain types of Gabra3 are actually able to suppress breast cancer metastasis. This activity is closely linked to the gene’s RNA. Dr. Huang and colleagues found that Gabra3 that had undergone RNA editing was found only in noninvasive breast cancers. When the RNA was edited, it suppressed the activation of the AKT pathway required for metastasis, meaning that breast cancer with this specific type of Gabra3 was unable to spread to other organs. This is particularly encouraging because interferons can increase RNA editing activity and could therefore prevent Gabra3 from activating the AKT pathway. In addition to further studying the role of Gabra3 in breast cancer metastasis, Wistar is actively seeking collaborative development partners to advance the targeted use of existing GABA-A receptor antagonists in Gabra3 overexpressing tumors. Furthermore, Wistar is interested in collaborations to develop blood-brain barrier impermeable GABA-A receptor antagonists as next-generation oncology therapeutics.